The Machining world is growing at an unbelievable pace. Handheld machines have advanced to highly sophisticated computerized machines (CNC). Similarly, basic 2,3-axis CNC machines have now led on to a more improved, more liked 5-axis CNC machines. While expensive, 3+2 axis and 5-axis machines are now a staple in almost every CNC machine shop. It’s imperative that both large-scale and small and medium manufacturing units are utilizing the one and many benefits of this machine type – who is going to pass the opportunity to get better productivity, higher accuracy at much lower costs (leaving the initial set-up cost, of course). But, there is more to 5-axis CNC machines than just that. Ready to find more? First on our list is, obviously, the points we mentioned before. There is a reason why machinists are fond of this machine type, even with complex process and all. 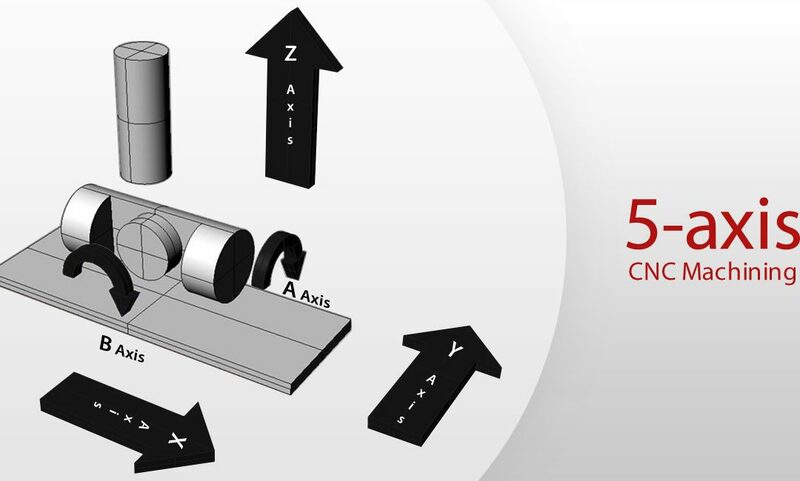 5-axis machining is the more efficient, accurate and improved of all its counterparts. Owing to less fixturing at multiple operations, using it directly translates to better work-piece quality and durability. This means good parts, less wastage, lower tooling costs, and shorter working duration. 2. Complicated shapes, angles made possible. With its ability to reach even the most complicated of angles, five-axis machines serve as a savior to all those looking for more complex 4D and 5D parts. Something we would never be able to achieve with your regular 2 axis, 3 axis machines. That too in a single setup, all thanks to its structure which makes it possible to reach out to both sides at one-sitting. All these things translate to better productivity and improved work-piece quality. 3. You can make use of shorter cutting tools. Shorter cutting tools are a mess to handle, especially with your general CNC machines. Thankfully, we are fully able to utilize the power of better tooling angles, better cutting speed, and precision parts with these tools as they can be fit well to a 5-axis machine. Here, you can have the head oriented towards the job and the cutter towards the surface. As the machine holds the tool well, the load on the cutter is reduced, resulting in decreased unfortunate breakages and vibrations. 5-axis machining is an absolute blessing for the drilling process, drilling of holes. This is due to its ability to reach to smaller and more complex angles (see point no. 2), giving a much cleaner finish. On a contrary, with 3 axis machines, you have to set up separate sitting for every angle. Which, of course, is both time-taking and cost engaging? This compatibility brings better execution to the planned designs. You are now able to achieve even the most complex of structures, quite easily. Plus, this mix has engaged a lot of job opportunities in the sector. All sounds good here. In a nutshell, 5-axis CNC machines are amazing to work with. Do you want to experience the sophisticated products resulting from it? Drop us a request and we’ll get you the machined parts fabricated exactly to your needs.